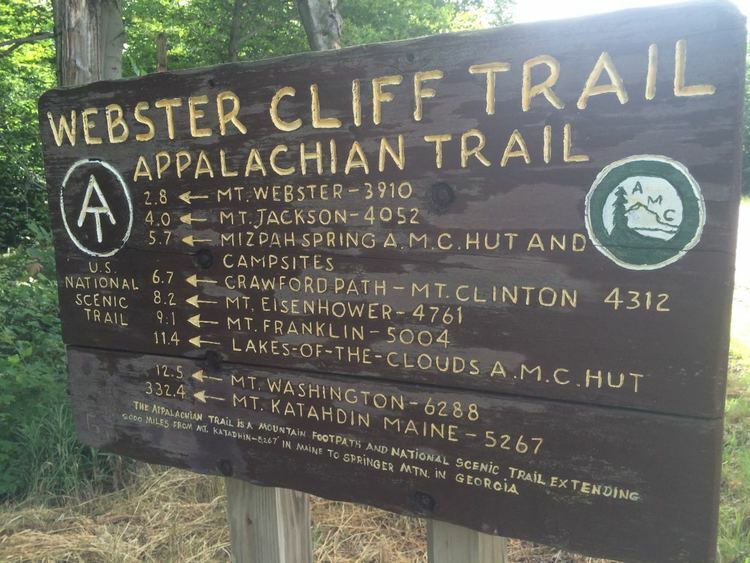 The Appalachian Trail runs through 13 states along the east coast of the US. It’s total length is 2,185 miles. 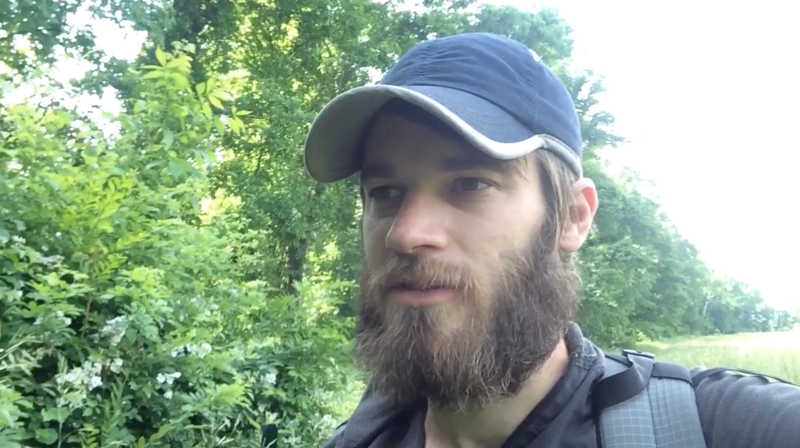 I left my job in Chicago to walk the entire trail. It took me 5 months to finish it. 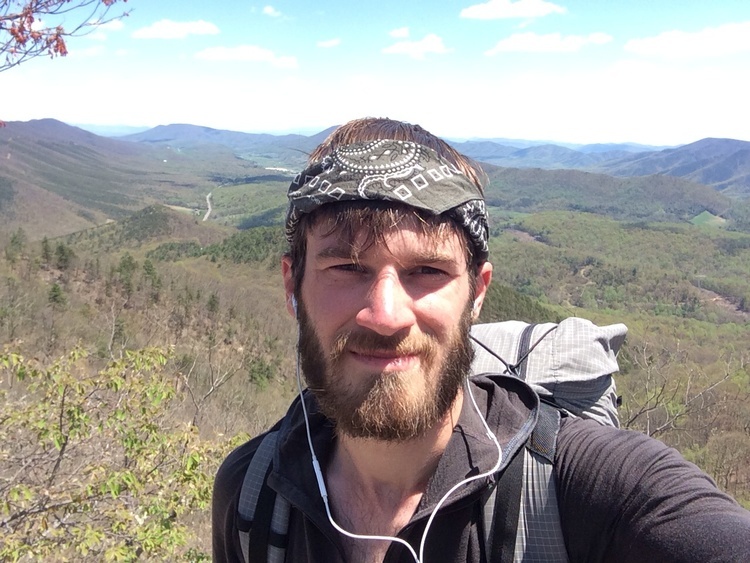 I started in Georgia and walked to Maine. So now I am officially a NOBO (Northbound) Thru Hiker. I tried to keep status updates on this blog of my location and general happenings each week but I didn’t do a very good job. 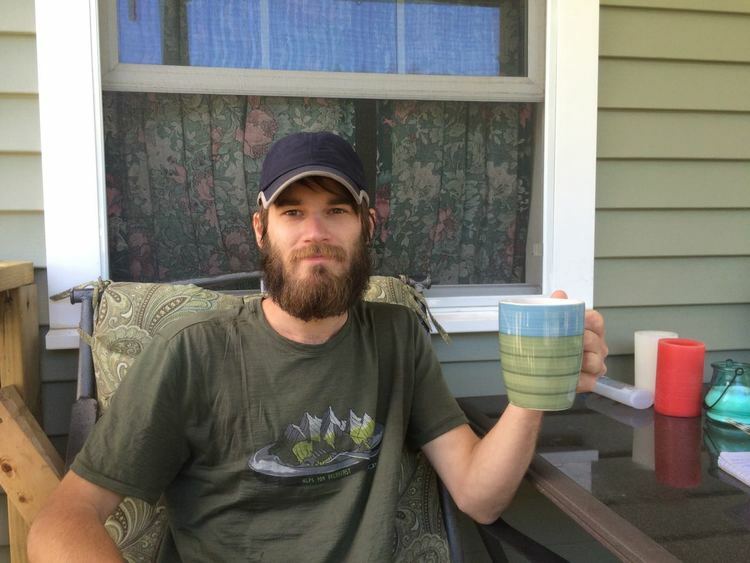 So now after weeks have passed since my August 12th 2014 summit of Katahdin (marking the end of the Appalachian Trail) So now if your willing to read this entire post I will update you on the last few months. I’ll start with the end. 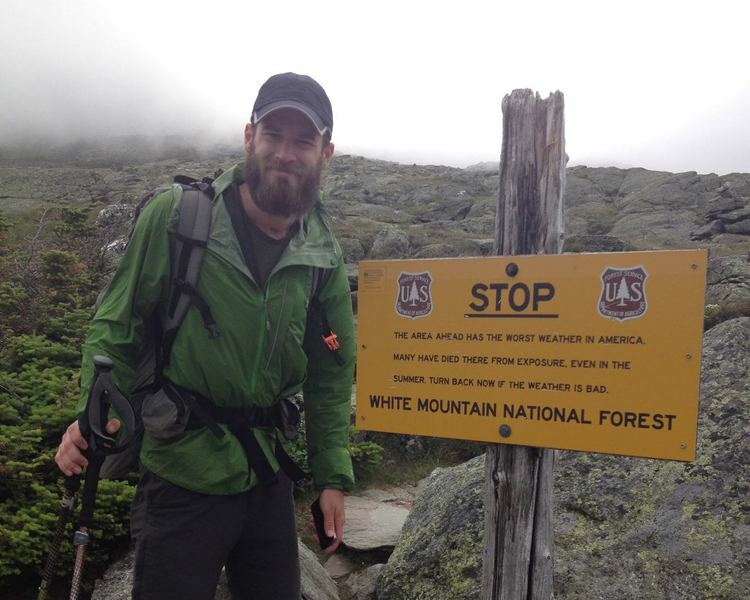 Walking the last 5 miles to the top of Katahdin was epic. 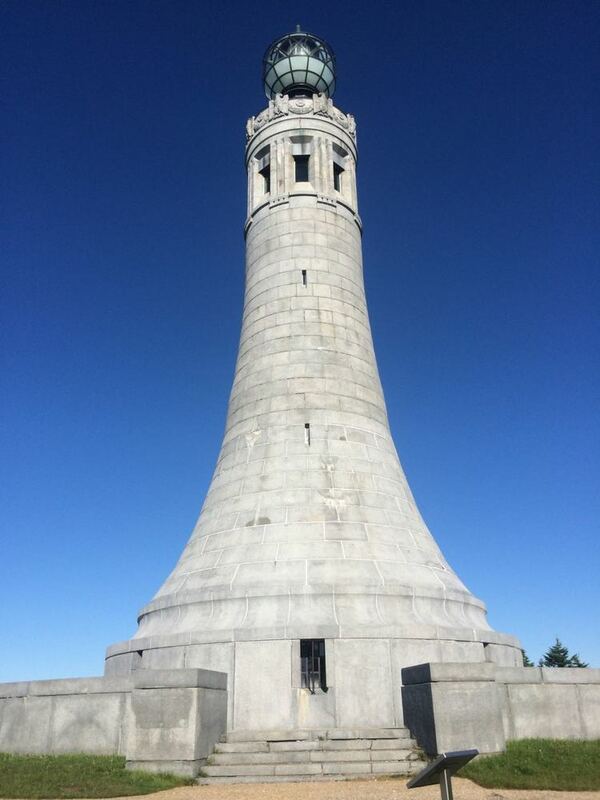 Climbing 4,000 feet to the top on a beautiful summer day was breath taking. I enjoyed the ending of my trek. As I climbed I ran into friends I had met along the way. At this point in my journey I was ready to be finished but also excited to celebrate what I had accomplished. I only wish I could have seen more familiar faces that day of other thru hikers I met along the trail. 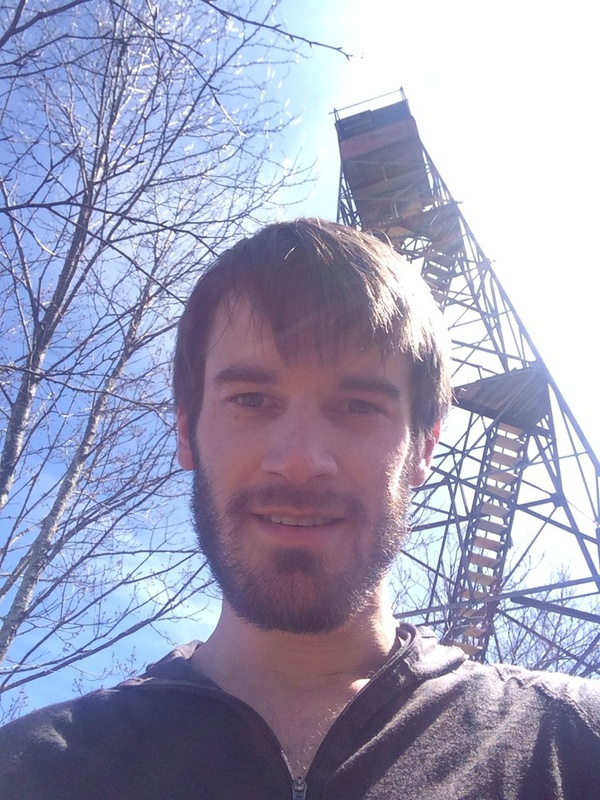 During the last two months of hiking I gave up on the blog post updates. Things got hectic with traveling home, meeting friends, and the desire to do more miles to finish the journey in under 5 months. After I had missed a few weeks of updates, it was easy to make the decision to wait until the end to do one large post. Let me catch you up on the last few weeks. If you want to know about the first 11 weeks, read some of my previous posts. Matthew Leverton came to visit me. I was really looking forward to his visit. I know Matthew from NIU and worked with him for almost 2 years at Digital Intent in Chicago. He’s a unique and very smart individual. I’ve learned a lot about programming from him for the last few years. Also, up to this point on the trail I hadn’t had any visitors come see me so Matthew would be there first! I was excited and thankful for his visit. 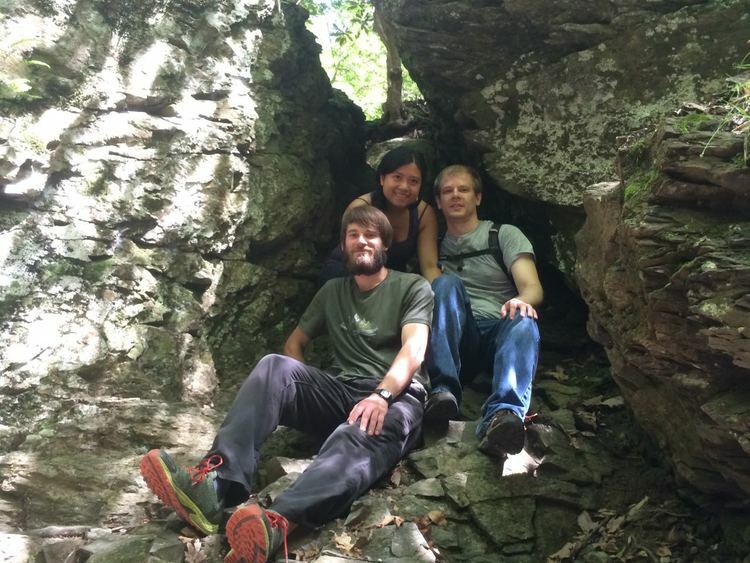 I met with Matthew and his girlfriend Pricilla at Delaware Water Gap on the New Jersey and Pennsylvania border. We hiked a section of the AT the day after they arrived. Although I ended up hiking these same miles on the AT over again because I wanted to hike the entire trail with my full pack. Some might criticize me as being a ‘purist’. I don’t really care what it’s called, I just want to hike the entire trail with my backpack and not as a day hiker. We also spent the next day at a state park where we camped out next to a nice lake. The next morning we headed over to a different set of trails to hike near some pretty cool looking water falls. Matthew and Pricilla headed home and I hiked on. The next week was a hard week for me. For the next five days after Matthew and Pricilla left it rained. I didn’t see the sun for at least 5 days. I pressed on through the rain and walked a lot of miles. I walked 150 miles that week. I basically walked all of New Jersey and New York in five days. At this point I also decided I did not want to pay to stay anywhere for the next few weeks. 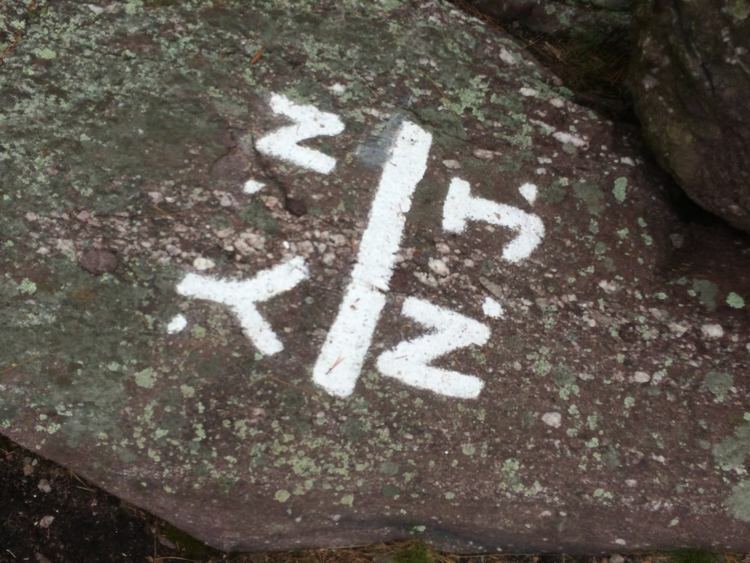 The middle states of the Appalachian Trail are expensive. I wanted to keep on a tight budget but I also kind of just liked the challenge. I almost caved and got a hotel when I was in New York. After the fifth day of rain and a bad nights sleep in a leaky shelter, I was very tempted to pay to get out of the rain. I convinced myself to press on that morning after finding a good place to relax for a few hours out of the rain. I sat under a sheltered picnic area with a vending machine and bathroom for at least 2 hours near the Appalachian Trail Zoo. This was a great place to just rest without being raining on. There is also something very mentally uplifting about having a Coca cola. During all the weeks of hiking I found that my favorite trail magic was usually just a coke and a piece of fruit (like an apple or orange). I had heard while hiking that I would be able to see the New York sky line from bear mountain in New York. But because of the continuous rain I could hardly see 100 feet in front of me. There where points on the trail that day where I was sure I was going to get lost because I could not see the white blazes. In a place like New York there are many side trails to get lost on. The white blazes are really hard to see in a dense white fog. After climbing down from bear mountain I walked through the Appalachian Trail Zoo. The trail runs right through the middle of the zoo. There are white blazes on trees and post signs. It’s a strange experience. In the zoo there are bears, coyotes and a few other animals. All of them looking pretty miserable. I felt bad for the animals. The trail leads right over the hudson river on a busy highway after leaving the zoo area. Most of the day I was surrounded by thousands of people who didn’t have any idea that hikers from over 1,000 miles away had walked there. I might have been challenging myself to not pay for anywhere to stay, but I definitely spent plenty of money on food while in New York. I ordered Chinese food from the RPH shelter, where the delivery guy walked right up to the shelter. Not having to even walk 10 feet to get hot food!! What a life of Luxury. During Week 14 I took it a little easier. I still walked over 100 miles but I didn’t push myself like I did the week before. I continued on my not paying to stay anywhere challenge and had made it to Connecticut. The terrain was still pretty flat but unlike New York and New Jersey the large wet bolder walking was over. There where some pretty flat sections of trail in Connecticut. I enjoyed the change. Connecticut felt pretty short, walking through it in a few days. After spending literally weeks in the one state of Virginia, it was nice to complete states in only a few days. I felt like I was making great progress. Massachusetts came next in the week. The great thing about this state is that there are tons of trail towns. Meaning lots of food that I don’t have to carry. The highlight of Massachusetts was stopping in the town of Dalton and tenting at Tom Levardi’s house. Tom was super nice and accommodating to long distance hikers. It was really a treat to have his help in Dalton. He drove hikers to the grocery store, and to the Old Country Buffet. Hikers love buffet’s. I hope Tom is doing well. Then week 15 was here and gone like the previous weeks. At this point, time was flying by. The days where really tough though. Not as much because of the physical nature of the trail but the mental and emotional trial of hiking for almost 3 months. I was pushing myself each day to continue hiking. Telling myself that if I made it through today that it was get easier. I can’t say that I was really enjoying the hike at this point in time. I was really ready to take a long break or just get off the trail. I did not want to quit either. I had to just push through each day. I was hiking in Vermont by week 15. The hills where returning. At least now after hours of walking in Vermont you are rewarded with some cool views on a few high points. A turning point for my mental state of feeling was Killington Mountain. This was the first time I had been over 4,000 feet in a long time. Since Virginia actually. The other motivation I had for hiking this week was my Brother was visiting. Joe was coming out to see me for a week on the trail. 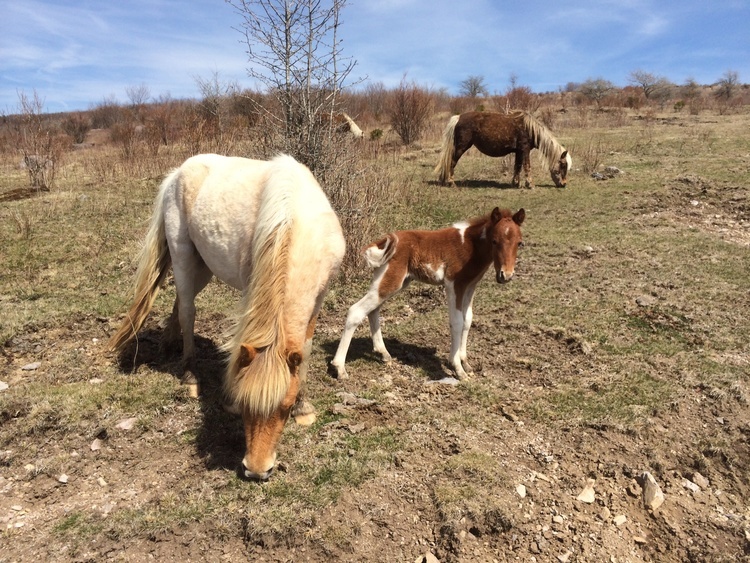 Week 16 marked the week of Joe’s arrival to Rutland, VT. I was glad to see him and excited to take a day off and use the rental car that he generously got for our convince. We spent a night in a motel getting great food and cleaning up. 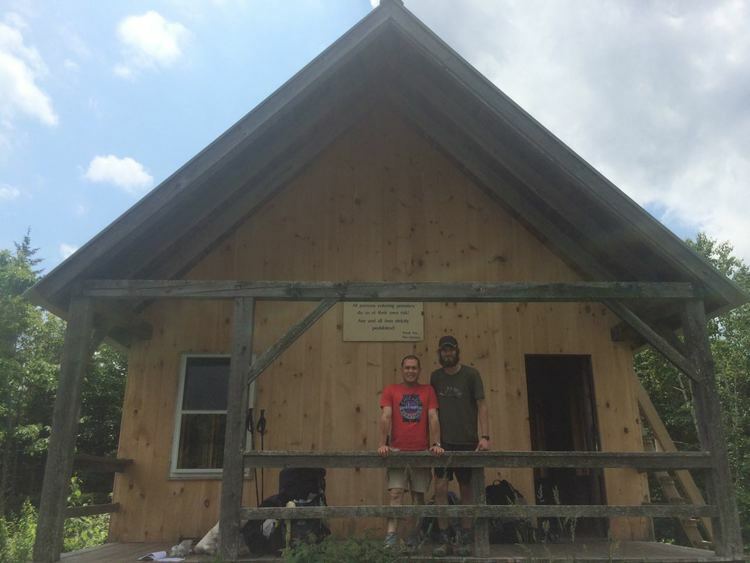 Joe and I took 5 days to hike the remaining 50 miles of Vermont to New Hampshire. If you don’t know Joe, your missing out. Joe at this point in his life was training for his first full length ironman. So as you might imagine you have to be in pretty good shape to do an Ironman (which he did accomplish weeks after our hike). 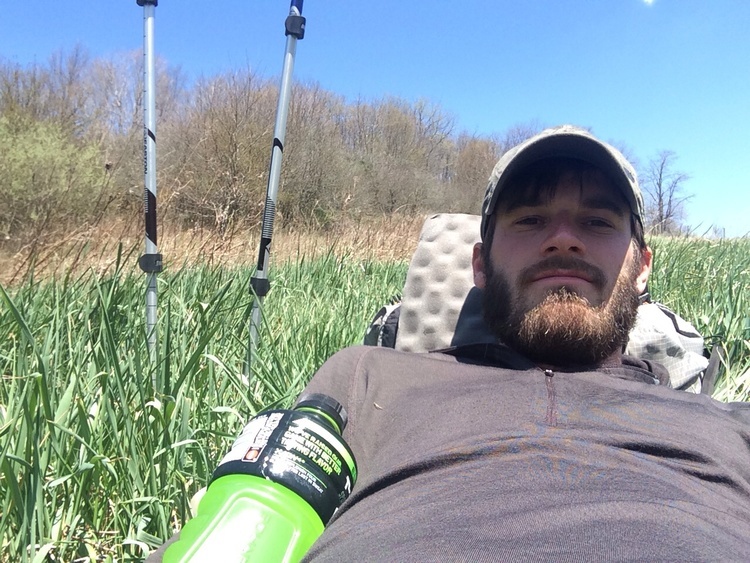 So when we hiked 10 miles a day and he carried about 15 pounds of gear and he was complaining (only a little) about how tough the trail was, it made me feel good. This was because I had spent the last 120 days conditioning myself to do one thing really well. I was a professional hiker. 10 miles for me was less than a half days work. 10 miles for Joe was exhausting. Even though Joe complained maybe a little, most the time he was in good spirits and enjoyed hiking along with me. I was glad that we hiked this section of the trail together. I got to show Joe a few aspects of the trail. Including longer 1,000 foot climbs, trail magic, trail towns, and friendliness of other thru hikers. I had a few people come visit me during the trail, but Joe I’d say was the only one who got a immersed thru hiker experience. As we walked into the town of West Hartford, VT we struck hiker gold! We where invited to enjoy break on a friendly trail angle’s porch. Coffee, hash browns, bacon, eggs and a good time. This home was conveniently set in front of a bridge that went over the ‘White River’. I was told that locals jumped off this bridge into the water 30 feet below. So I had to take on this challenge! We hiked into Hanover where we where taking the bus back to Killington, VT to get the rental car. We hung out in Hanover for a few hours. Eating pizza, donuts and a few beers before taking the bus. 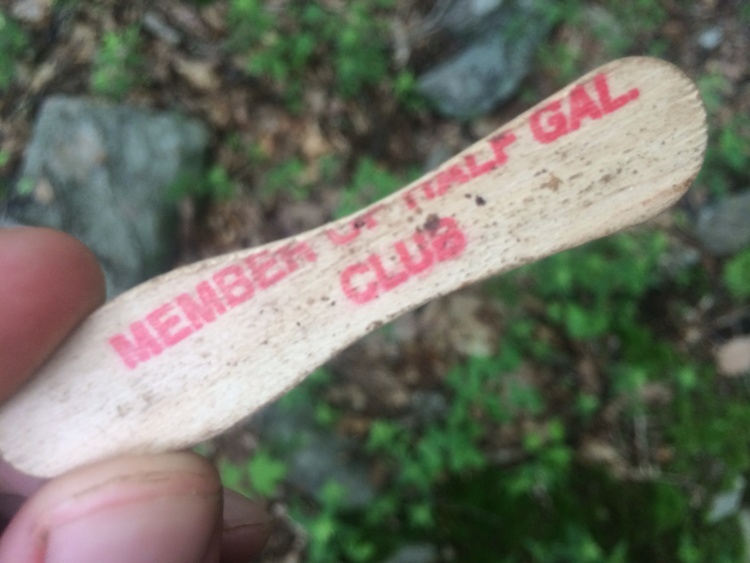 We took the bus back to where we started hiking together in Killington. We relaxed in town, watched a movie, and ate thai food. It was really nice relaxing in town and taking a few easy days before I began hiking again. Joe left to go home and I had a few days before I would need to board a bus to Boston. 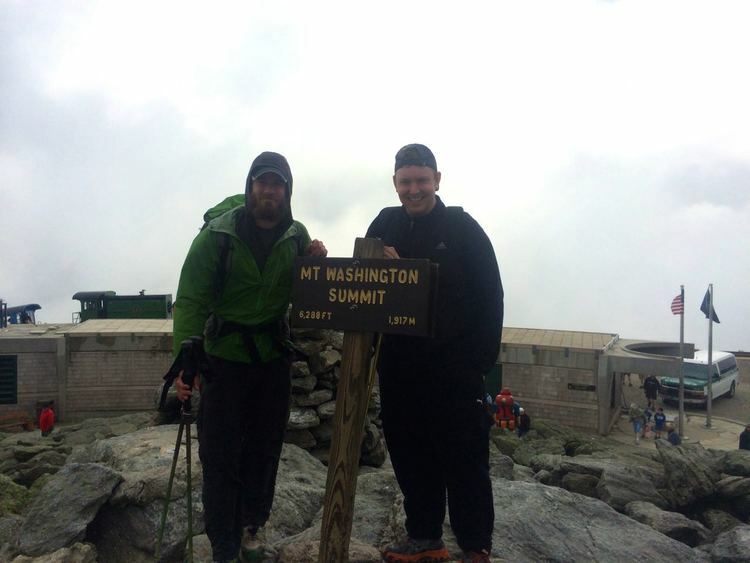 During the few months that I had been on trail my best friend Tim had decided to get married. He asked me to be in the wedding and I had to go. 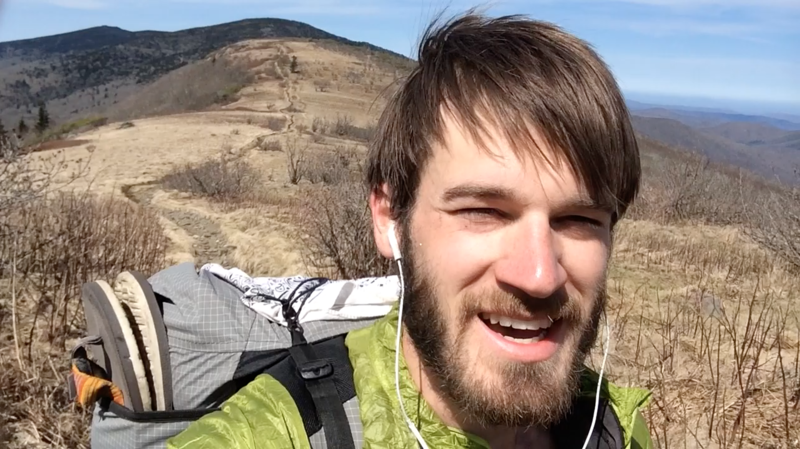 So I felt like I needed to push hard and put in a few good days of hiking before I left. I had originally planned to get to Lincoln, NH, but I got there too quickly. So I did another 25 miles to get to Crawford Notch. I then took the AMC Hiker Shuttle to Gorham, NH and then caught the Concord Bus to Boston. From Boston I took a flight to Chicago. This basically required almost 2 days of travel. All this travel just to make it to Tim’s wedding. Well worth it. During this week I did do a good deal of walking in New Hampshire. 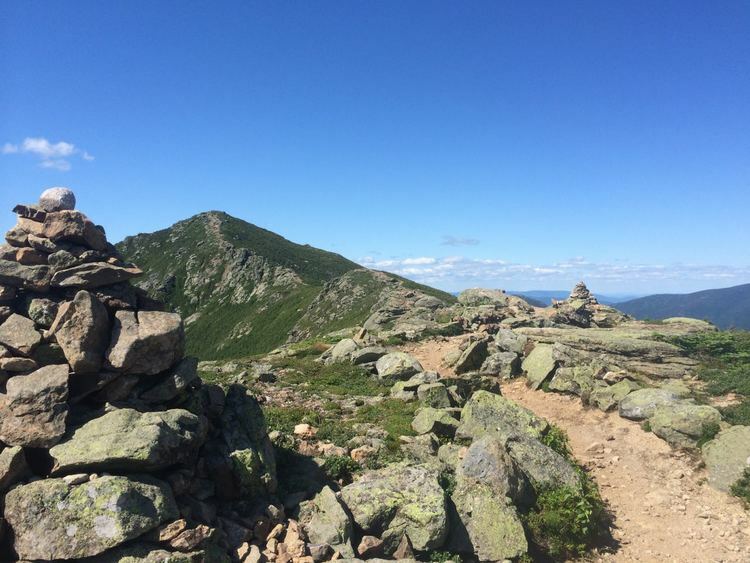 One of my favorite views during this week was on Franconia Ridge. 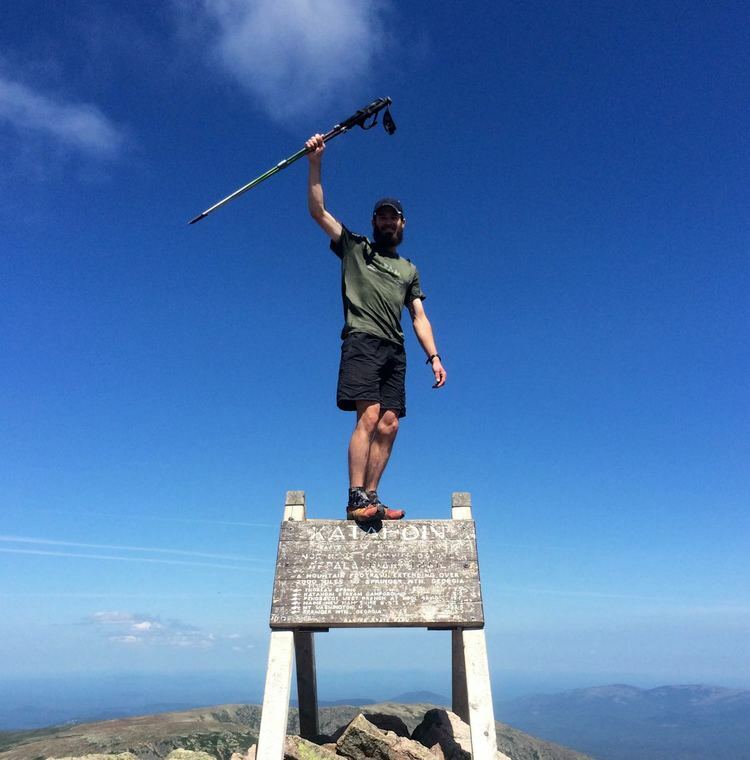 After a long day of hiking and a 3,000 foot climb around 2 pm I got to Franconia Ridge. The weather we perfect. Clear blue sky’s and a good breeze to keep me cool. The view’s were stunning. I had seen nothing like it up to this point. You could have told me I was hiking in the rocky mountains. I arrived back in Chicago on the 15th. I was tired but happy to be back to see friends and family. I tried to keep my agenda simple for this week but that was hard to do. Without a car getting around to see friends and family was not easy. Took a lot of coordination with my mom and her generosity with her car. I won’t say much about Tim’s wedding, but it was great. Tim Smith has wanted to be married basically as long as I have known him. I know he was excited and I was excited for him. It was great to be there on that day. 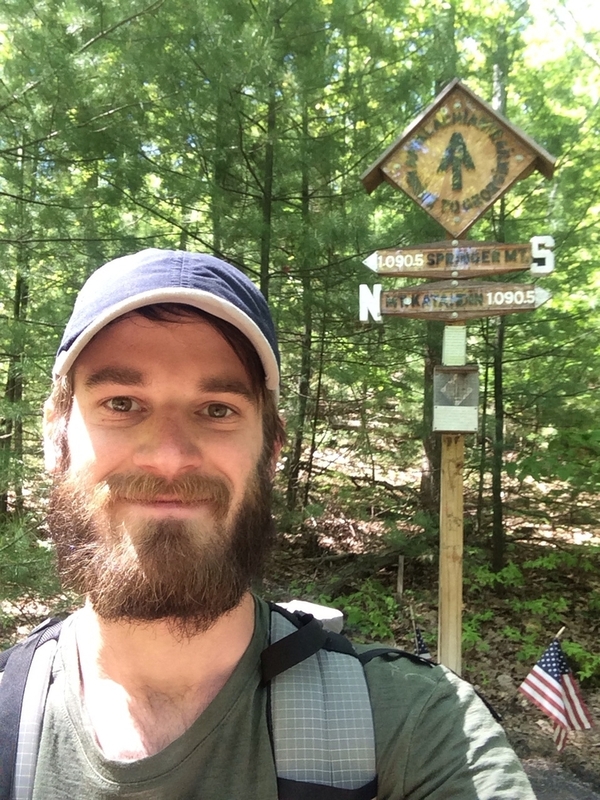 A good thing was I had my friend Nick McMaster who accompanied me back to the trail where we would hang out in Boston for two days and then hike a small section of the trail together. Nick lucked out because he would be hiking 20 miles with me on one of the most spectacular places in the world. We would be climbing Mt. Washington. The unlucky part for Nick is that it would be a very tough climb. This was easily one of the top 5 hardest parts of the trail to hike. I had originally planned to take on the climb in smaller sections. 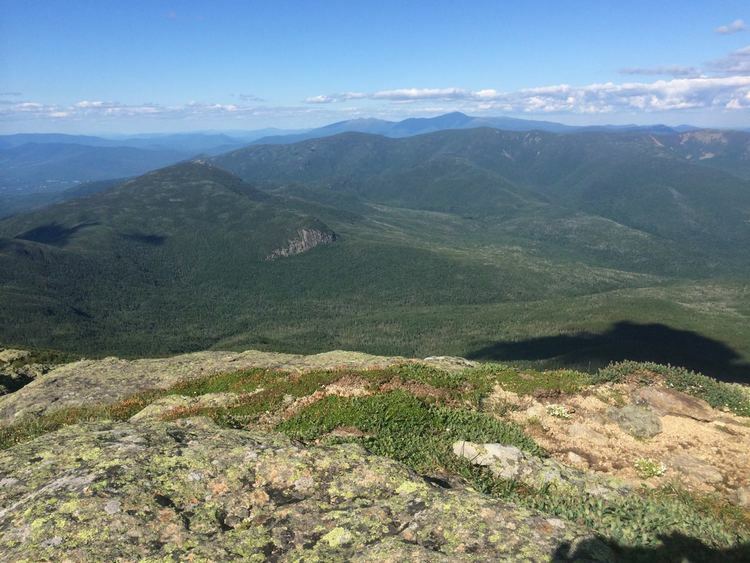 The problem is that finding places to camp in the White Mountains can be challenging. I had originally planned to do 6 to 8 mile a day with Nick but we ended up short a day because of the bus schedule. This meant that we would have to hike the 20 miles in basically 2 days. The second 11 mile day turned out to be a really tough day. Nick’s feet suffered because of it. I won’t get into details but I was surprised he was able to walk at all by the time we where done. The amazing part is that I don’t remember him complaining about it at all. It was pretty awesome walking the trail through the Presidential Mountain range. I was not only impressed with Nick’s efforts but also pleased that he was there to hike that part of the journey with me. It was my fault for pushing Nick too far. I should have planned better. Logistics are difficult to plan when all you have is a phone and little knowledge of the area. All in all, Nick had fun, and so I did. Nick headed back home to Chicago and I continued forward on the trail. I knew I only had a few more days left in New Hampshire and then the State of Maine. I was super ready to be done. 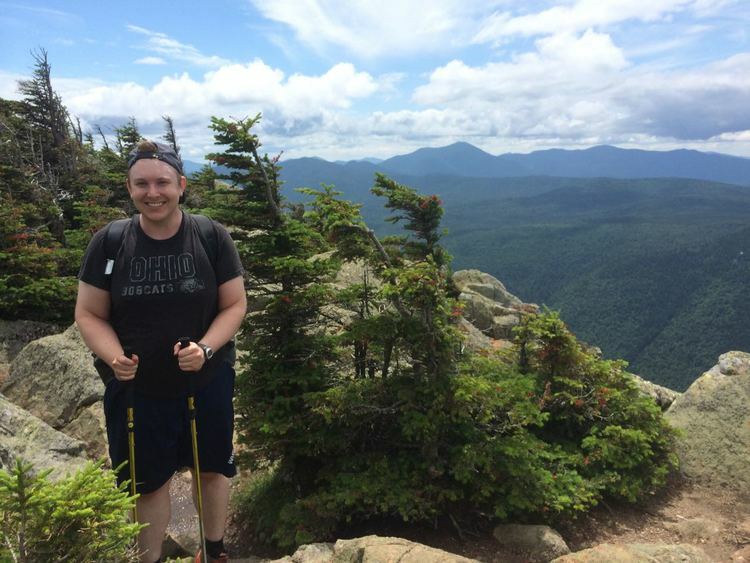 After spending a week at home and hiking for almost two weeks with other people my pace was dramatically slowed down and I knew that if I wanted to catch any of the people I had hiked with before I would have to push hard. The challenging part was the southern section of Maine was harder than I had anticipated. During week 20 finished off New Hampshire. The end of New Hampshire was harder than I initially expected. I did a 21 mile stretch over Wild Cat with a hiker named purple blaze in 8.5 hours. It rained the entire time, we where soaked all the way through. I even forged a river up to my waist in water. I entered into Maine and found that southern Maine continued to be harder than I expected. Some of the toughest trail was in Maine. It slowed my pace down to 1 mile an hour in some places. Maine had everything I had seen in the trail up to now. Maine had rocks, bogs, roots, and so much more. Maine was the last state, I was excited to be there. I couldn’t believe that I had made it that far. 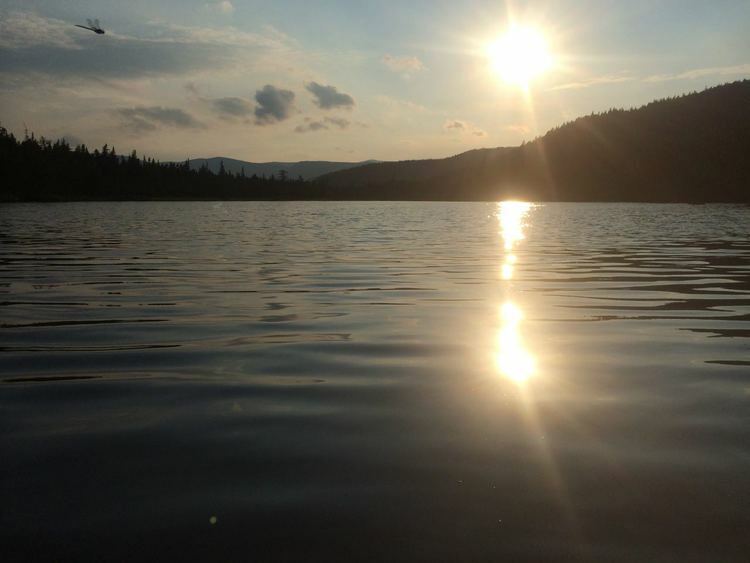 The highlight of week 21 was the hundred mile wilderness. 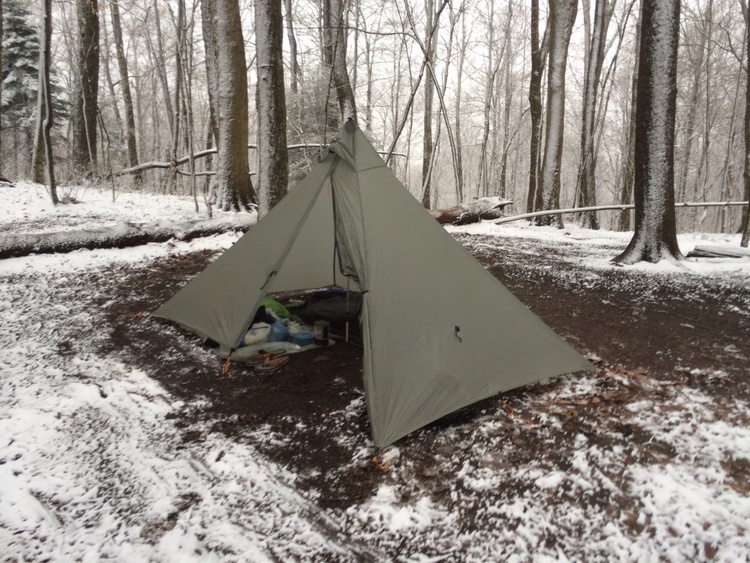 100 miles of trail with no resupply. I pushed really hard through the 100 miles and walked it into 4 miles. I did 70 of those miles in 2 days. 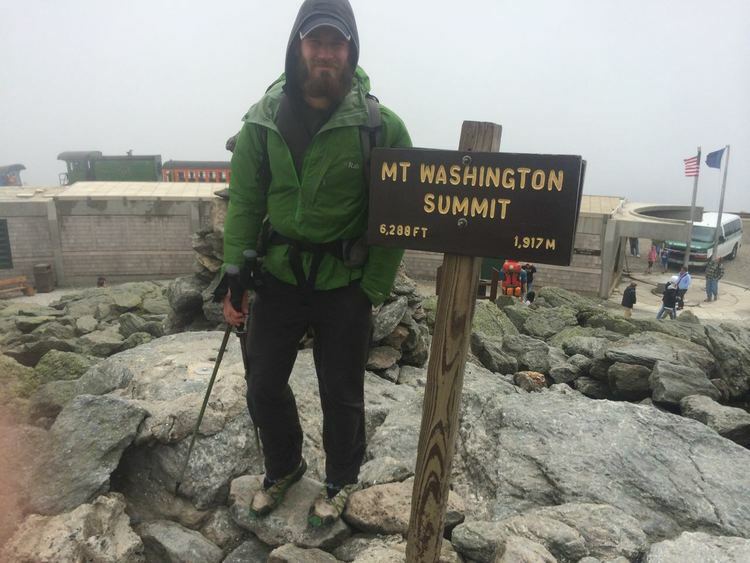 The farthest I had walked in a single day only days before my summit of Katahdin. I finished the trail in 21 weeks and one day. I’ve learned a lot about myself hiking this trail. To face uncertainty. To be able to live with very little. To pursue the work and place where I want to be. I don’t know all the answers, but each day I’ll work on figuring it out. For the last few months all I’ve heard from other hikers in response to complaining about rocks on the trail is, “just wait until you get to Pennsylvania”. Well, now I’m in Pennsylvania and there are lots of rocks on the trail but I don’t think it lives up too all the hype. 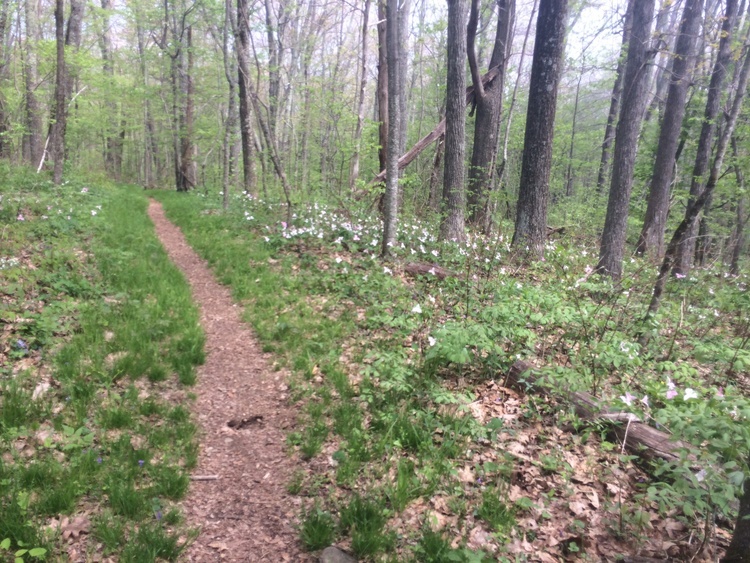 Most the time, the Pennsylvania trail is a few miles of very rocky trail connected by a few easy miles of flat dirt trail. 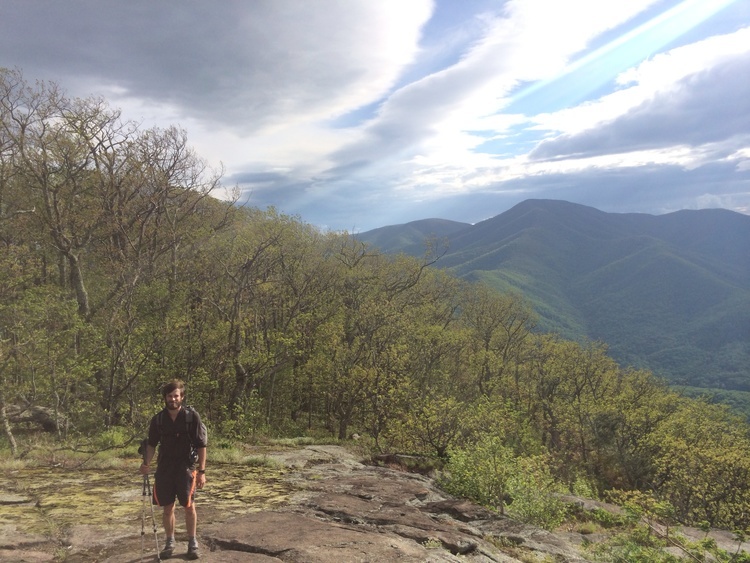 I was pleasantly surprised to find out that Pennsylvania is a terrific stretch of the Appalachian Trail. I really enjoyed week 11 in Pennsylvania. I did not need to walk very many miles compared to what I had been walking per week. This slight change in pace was enjoyable. 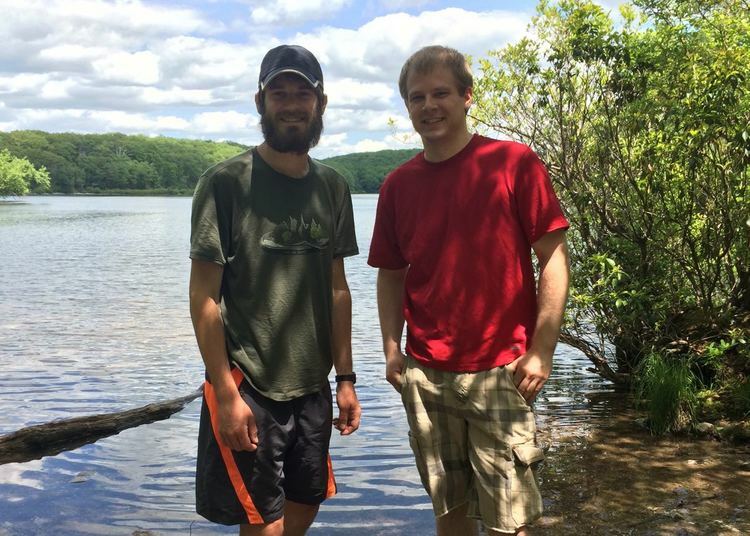 The reason for my change in pace is because in week 12 I met up with my friend Matthew Leverton in Delaware Water Gap who came to visit me. Anyway, Week 11 started off in the town of Duncannon. I took rest and resupply there. In this small trail town there is a well know hotel that hikers stay at called the Doyle. So where else would I want to stay? The Doyle does have a reputation of being a dump … so my expectations were low. It turned out to be very enjoyable place. One of my favorite places to stay on the trail so far. I was up on the fourth floor, in the 100 year old building, with a corner room with two windows. The room was smaller than my dorm room in college, but it was dry and cozy. There were also a few other hikers there so we where able to hang out, enjoy the good bar food, and a few cold beers. When I was in Duncannon I got mailed a new pair of shoes. So I had to wait until 3pm until the UPS guy showed up. This also meant I could take an easy day out of town to break the shoes in. I only went 5 or so miles up som more rocky Pennsylvania. My shoes where broken in very quickly. Walking out of the town I remember being dive bombed multiple times by a falcon. First time I’d seem (or at least noticed) a falcon on the trail. After Duncannon there were a few notable shelters along the way. The main one being the 501 shelter. This shelter is fully enclosed and feels more like a hostel than an AT shelter. I was able to order a large pizza and chicken parmesan sandwich that was delivered to the shelter. A life of luxury. The highlight of week 10 was reaching the psychological halfway point. Even though it’s not really half way, Harpers Ferry, is about 1000 miles and it felt really good to have made it that far. I had my photo taken, got a burger and a milk shake, and then resupplied my food bag. I headed back out of town the same day I arrived. I didn’t feel the need to stay in town since I spent so many days in Damascus last week for Trail Days. Leaving Harpers Ferry I distinctly remember the millions of inch worms that must have been on the trees. The forest sounded like it was raining, but instead of water it was raining inch worms. Inch worms create astring that they hang from the trees by, similar texture to spiders webs. Walking that 5 miles of trail with the inch worma was very uncomfortable. Another highlight of the week after leaving Harpers Ferry was leaving Virginia! Yay! After spending weeks in Virginia it was nice to reach the next state. 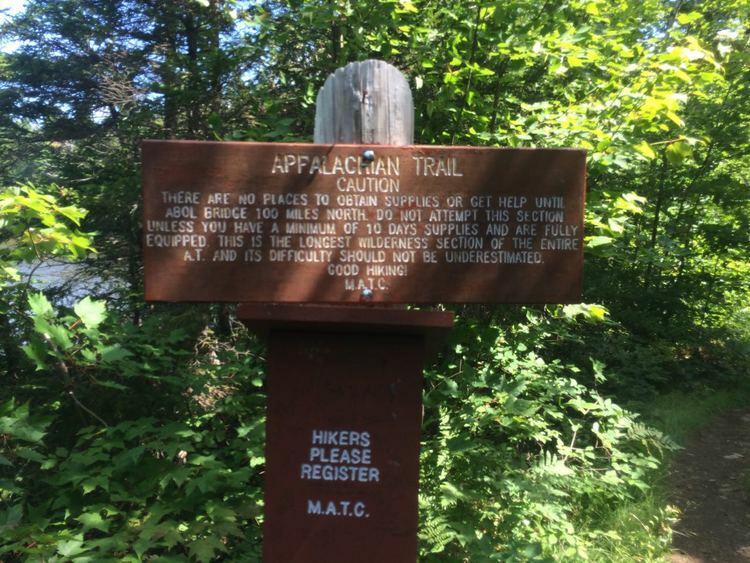 West Virginia and Maryland are very short trail states and have few miles of the Appalachian Trail running through them. 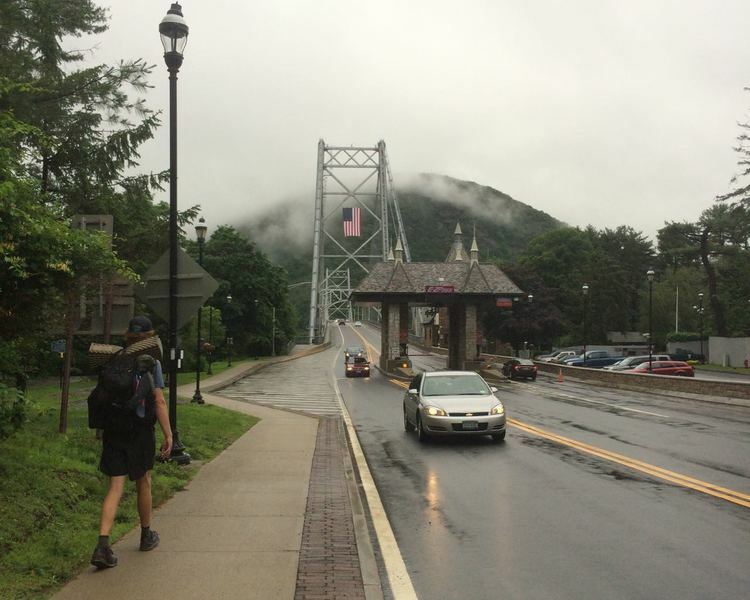 I was able to hike through both states and into Pennsylvanian in one day. I made it to Pensilvania and the real half way point in week 10 too. It’s a hiker tradition near the half way point of the trail to eat a half gallon of ice cream in a half of an hour. This proved to be pretty easy. As a reward I got a little wooden spoon to prove I completed the challenge. In week 11 you’ll get to hear about all the rocks in Pensilvania. I’m not one of those people who finds writing easy. I wish I was able to write clear sentences and enjoy written communicating with others more, but I don’t. 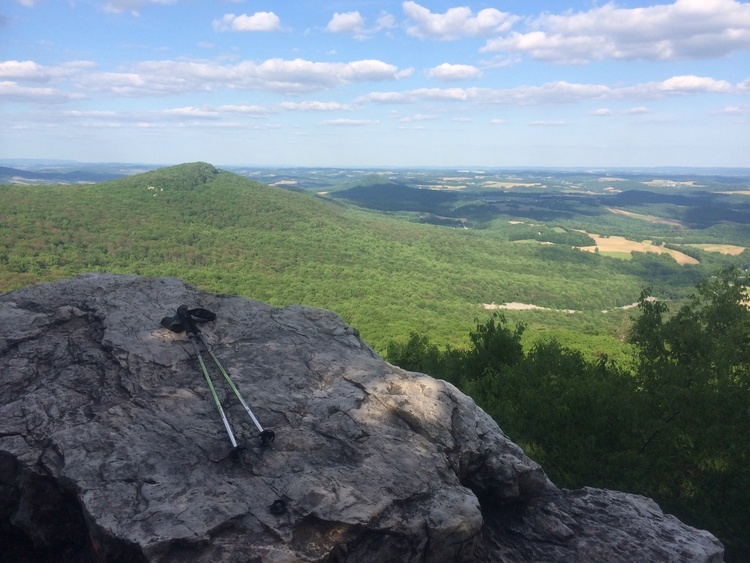 So when I challenged myself to write weekly updates about my status and story on the Appalachian Trail, I’m not entirely sure what I was thinking. This said, I don’t plan on giving up on weekly updates, but I ask for forgiveness on the delay. As I write now I’m actually beginning week 12 on the trail. So week 9 was only a few weeks ago, but some of the details are a little fuzzy. I do keep bullet point reminders of events and activities to help jog my memory for later post updates. The trail through the Shenandoah’s was terrific. Spring was in full bloom. Flowers at this point where along the edges of the trail and the green canopy provided full sun protection. 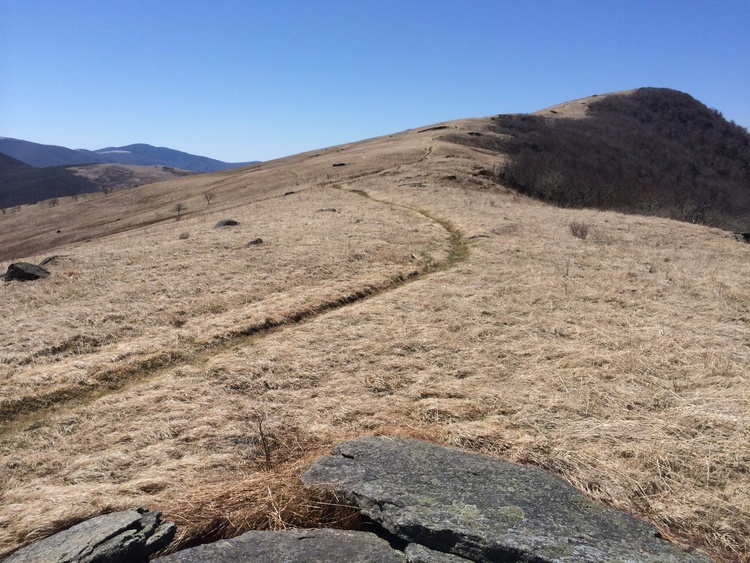 The trail in the Shenandoah’s runs from mountain ridge to mountain ridge. Great views and scenery almost everyday averaging around 25 miles a day. The weather was great almost every day too. A few of the shelters where not very pleasant and water was harder to come by. The first shelter I stopped at for the night had a 20 lb rat who would walk around the shelter as soon and the sun set. I decided to sleep in my tent that night. The Shenandoah’s also have a road named the Skyline Drive in the Park. This road twists and turns across the entire length mountain ridge running parallel to the AT most the time. I was very happy about this road because it meant daily crossing for me and other hikers to stop and eat. Along the Skyline Drive, about every 20 miles or so, there are Wayside restaurants that serve delicious cheesecburgers and french fries. Needless to say, I ate well through the Shenandoah’s. I also went back to Damascus Virginia for Trail Days. Trail Days is a hiker festival (the biggest one) that happens annually. I didn’t originally plan on attending but things worked out nicely so that I had a ride to and from Damascus. This was important since it was a 4 hour drive away. Trail Days was a good time, not all that exciting though. It was mostly just a nice 3 day break from walking. I enjoyed checking out all the outdoor gear companies that attended and seeing fellow thru-hikers in one location. I’m glad I went. Week 10 update will follow soon. I walked out of Daleville like I normally leave town thinking about how I’m going to miss town food and hot showers. I usually get over it in a few minutes and my desire for town food only returns periodically between trail meals. This time in returning to the trail I remember a distinct feeling of being back home. The trail is no longer a foreign place. Instead it’s where I want to be, it’s where I’m most comfortable being. I walk into the woods and feel like I’m back home. Anyway, I left early in the morning walking down the road to the trail head. A women at the post office offered a ride, saving me a mile of road walking. 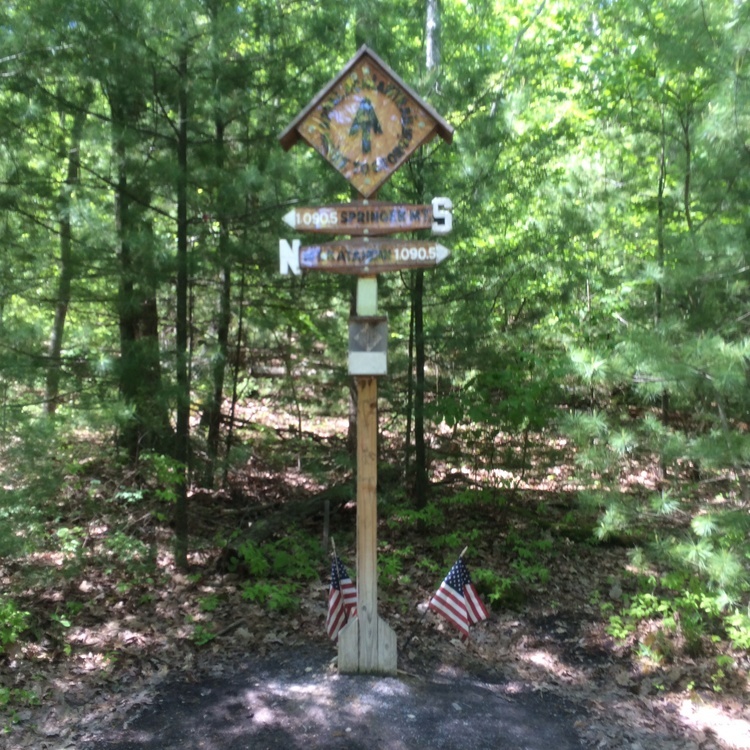 In the smaller trail towns people know about the hikers and help out this way. I set off walking early by myself hoping to catch up to a few others after falling behind a day. 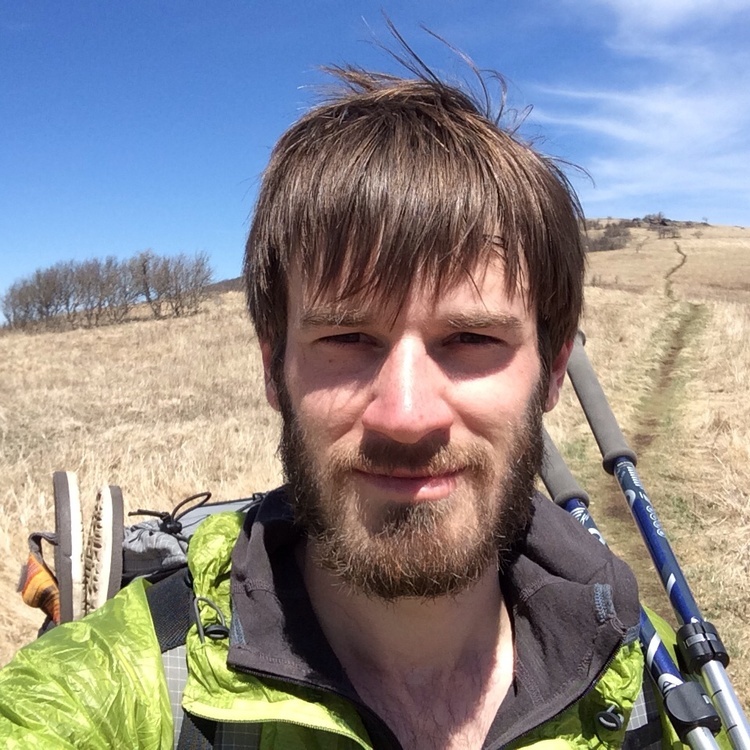 In the next few days I walked a long days with the goal of getting to the town of Buena Vista. I decided not to stay in the Buena Vista over night when I arrived, but to only get in and get out the same day. I stopped by the main hiker hostel in town called the blue dog cafe. I got a ride into town by the owner of the cafe. This was a nice cafe/hostel combination. I grabbed breakfast there and walked over to the dollar general to resupply with food for the next few days. This town was very friendly and was a great way to spend a few hours out of the heat of the day. 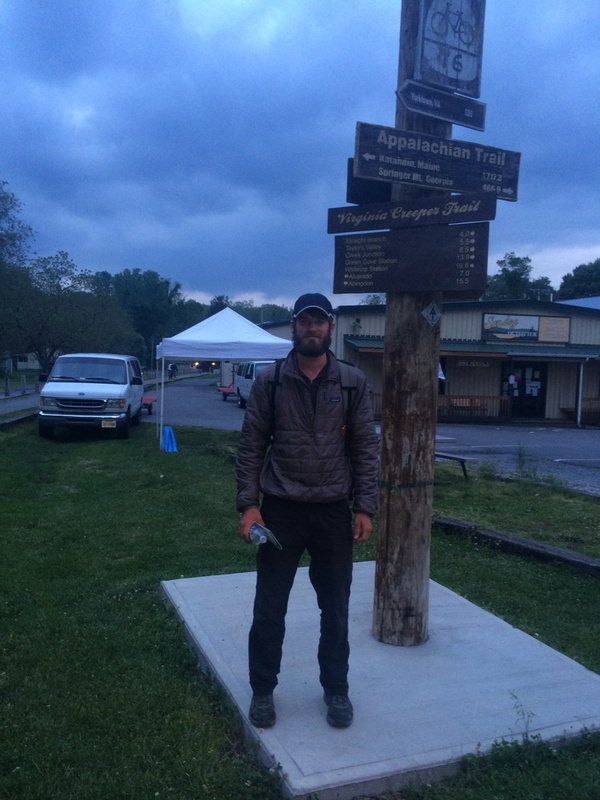 I pushed on doing a few more big days (30 miles a day) and got to the town of Waynesboro, VA. I stopped here to stay at the town pavilion and use the town YMCA to take a shower. I ate at an all you can eat Chinese buffet for dinner. Then, in the morning, I did my first solo hitch out of town. Worked out fine. Waynesboro was larger than I thought it would be. Was nice to get a free shower and eat a good meal. 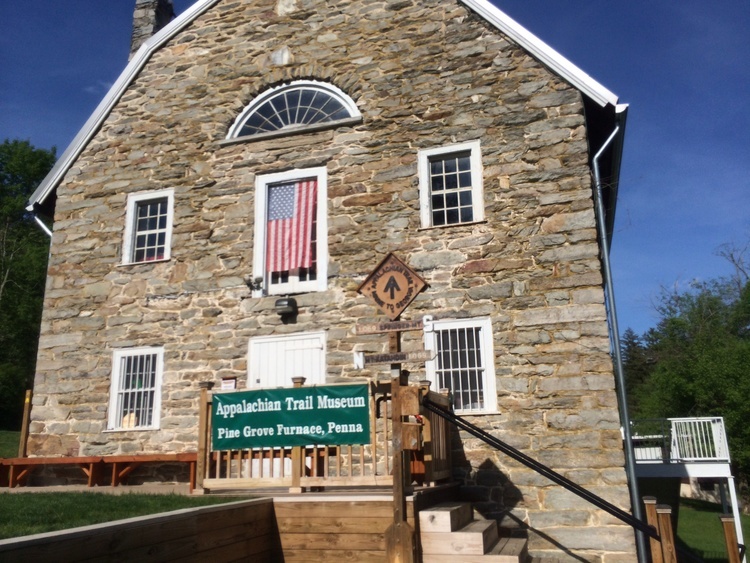 Leaving Waynesboro is where the Shenandoah National Park begins. 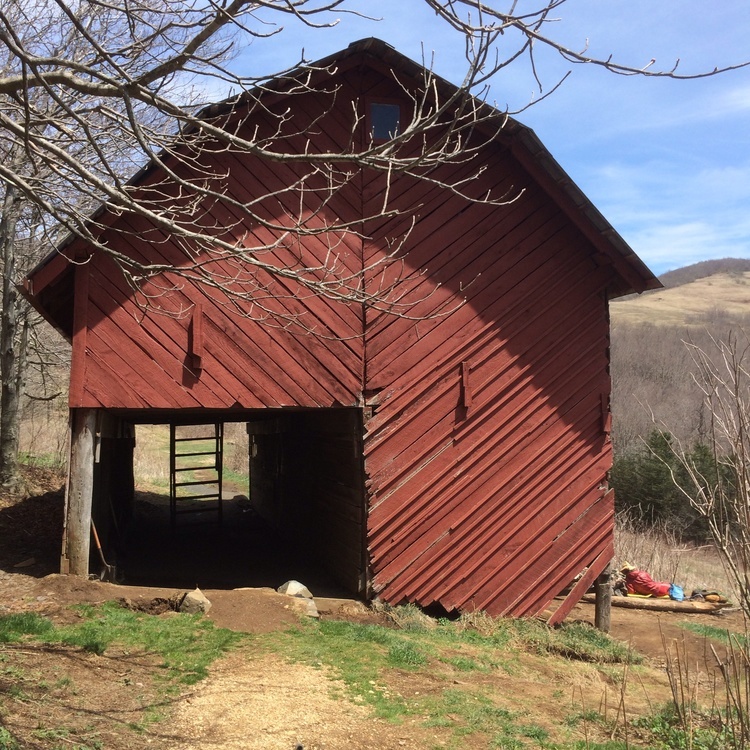 I’ve heard little about the Shenandoah’s prior to starting the trail but many hikers talked about looking forward to this section on the trail. I heard there was a large bear population and places to eat almost everyday off the trail because of the large amount of tourism. 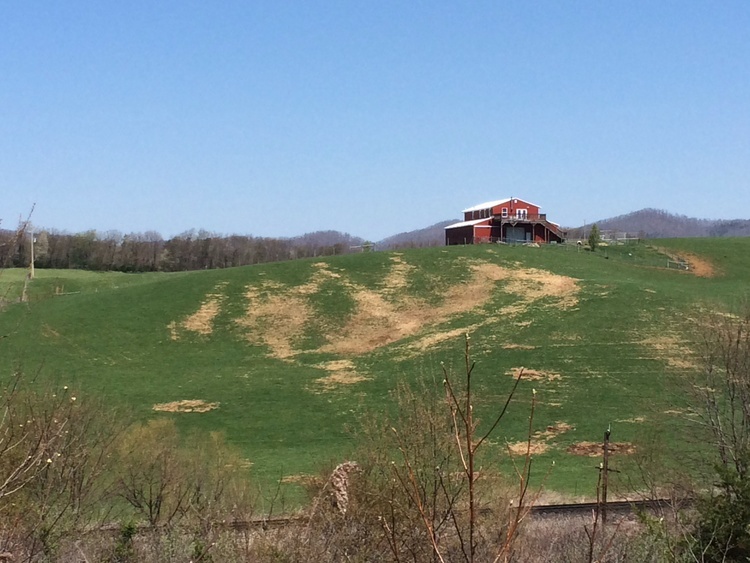 I’ll save the details of walking the Shenandoah’s for the next update (week 9). After eight weeks on the trail it’s nice to reach a level of comfort being out here. Walking along the trail has been easier to enjoy each day and enjoying the section of the trail I’m actively walking. It’s been amazing to be immersed in God’s creation. I hope to continue to enjoy my time out on the trail with a daily thankfulness for what He has created. 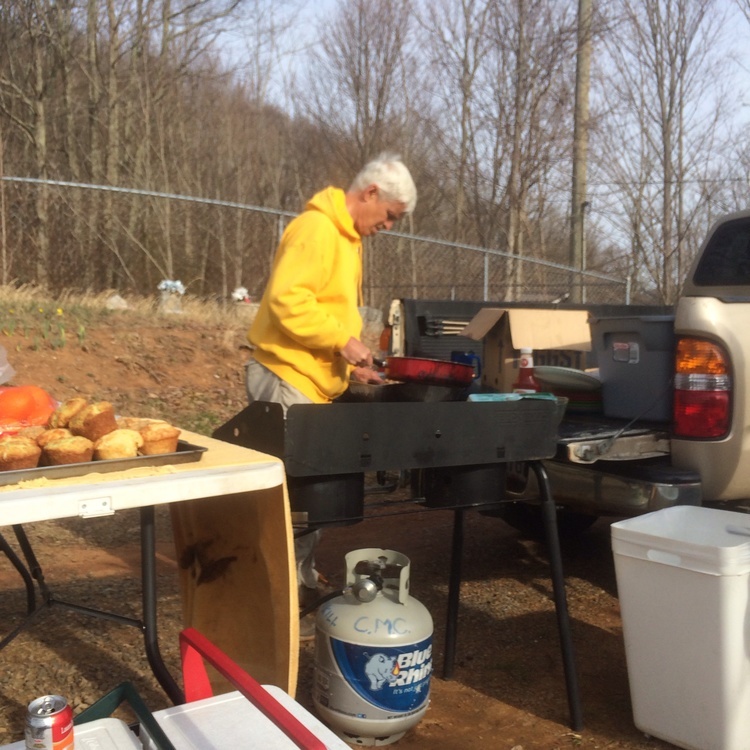 Gather a group of hungry hikers together at a free church breakfast, the food will disappear faster than it can be served. As a hiker we primarily walk, eat, and sleep. Each day I wake up and prepare to endure an entire day worth of physical activity. By the end of the day I’m sore, tired, and completely out of energy. I wake up feeling barely recovered enough from the previous day to do it all over again. It’s hard to see improvement day by day, but over the stretch of a week I can see myself becoming stronger and stronger. This week I hiked farther than I ever have before. Walking 27.5 miles from 7am to 7pm. As the terrain flattens out and my feet continue to grow stronger, I’m sure I will walk even further. I started this week from Erwin, TN. Where I stayed in a hostel called Uncle Johnny’s. This hostel and outfitter was conveniently located right next to the trail. I was able to rent a bicycle for two dollars and ride into town. Ridding 7 miles into Erwin, after practically running 9 miles to town, I hastily headed to Pizza Hut for lunch to enjoy an all-you-can-eat buffet. 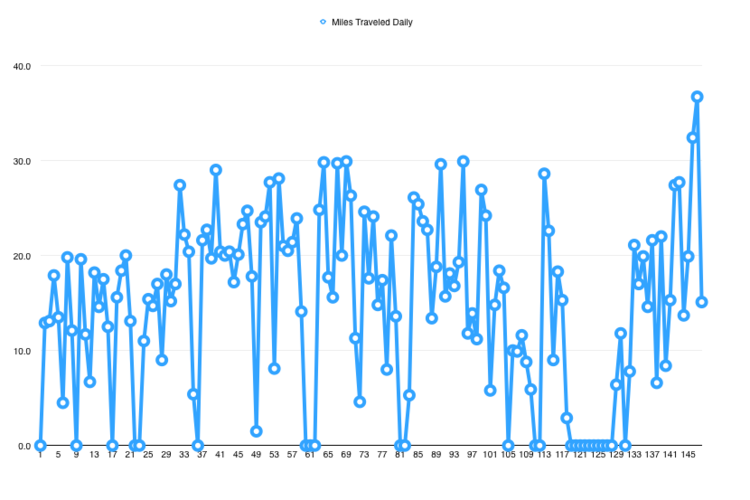 The round trip of 14 miles on a bicycle seemed like lightspeed compared to walking. It was a good change of physical activity that I believe further increased my endurance and strength of my knees. After spending the entire day Erwin, TN I left as it began to rain. By the middle of the day I got wet as the rain changed to snow. The blizzard moved in fast with very high winds. I covered 18 miles that day moving quickly to stay warm. At no point did I ever feel cold or in danger. The adventure of hiking through a snow storm is a lot of fun with the right clothing. I made it to my destination set up my tarp, crawled into my bivy, and heated a water bottle to stay warm the entire night. 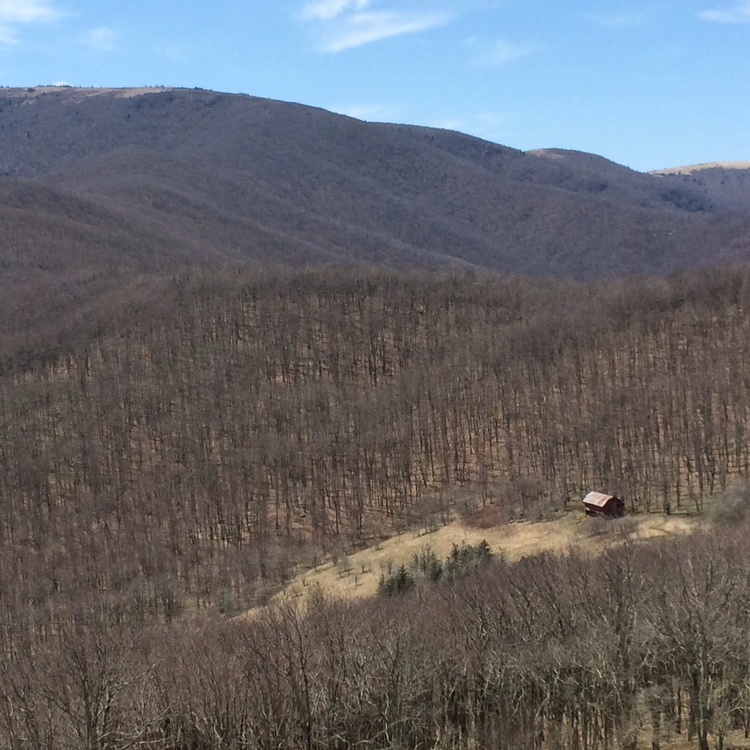 From there I crossed Roan Mountain and a few other very cool bald top mountains. Passing by one very unique shelter that a farmer donated to the Appalachian Trail. The shelter is open big red barn. It was a neat place to sit briefly during the day while the sunny was out and the temperature was warm. I’m glad I did not sleep at the shelter though. From other hikers I heard many people were very very cold. It gets very windy on that side of the mountain apparently. This week I also pushed myself to do more cowboy camping. This is where I don’t bother setting up the tarp and sleep directly underneath the stars. This open air style of camping is a lot of fun especially when you do it occasionally alone. There is little set up during the night and very little takedown in the morning. This happens to also be very convenient for a hiker since time is important to walk the distance. I ended the week making it to a important destination on the trail. 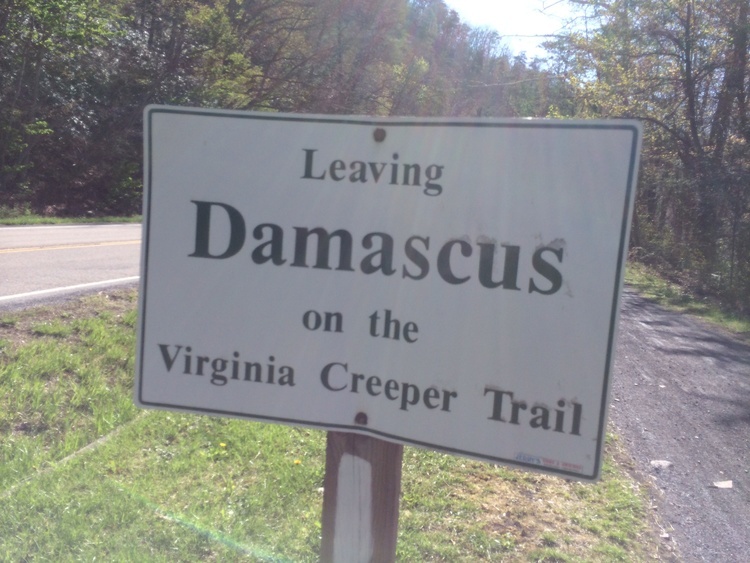 The town of Damascus in Virginia is a landmark town of the Appalachian Trail. This is the location of where Trail days is held every year in May. I will not go to trail days this year, because I would have to travel over 400 trail miles south back to Damascus. But anyway, in this town I stayed in a unique hostel named Crazy Larry’s. 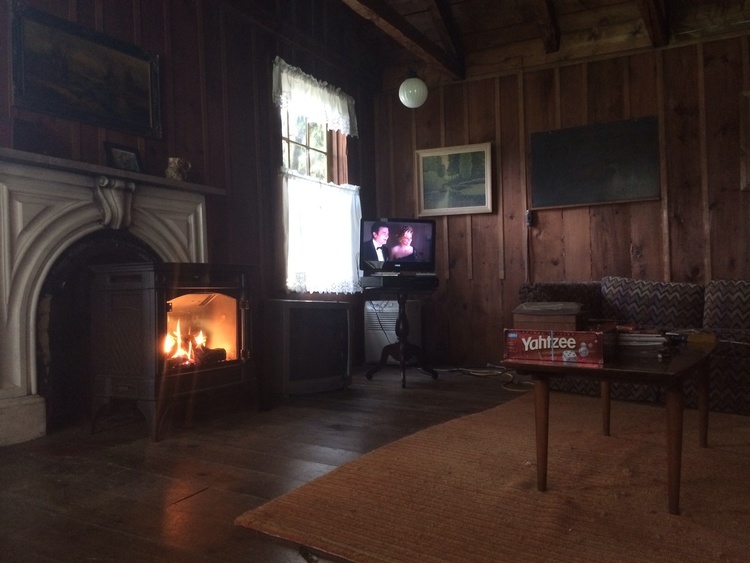 It was basically like staying in someones house. Larry was very hospitable and has a unique character (as you might imagine). I took a zero day in Damascus and enjoyed the many small town places to eat and spend time relaxing. During week six I intend to push myself to travel more miles. Not just for the sake of making the miles, but also as a challenge to myself to see what my body can do. This mostly requires not hiking faster but hiking longer. 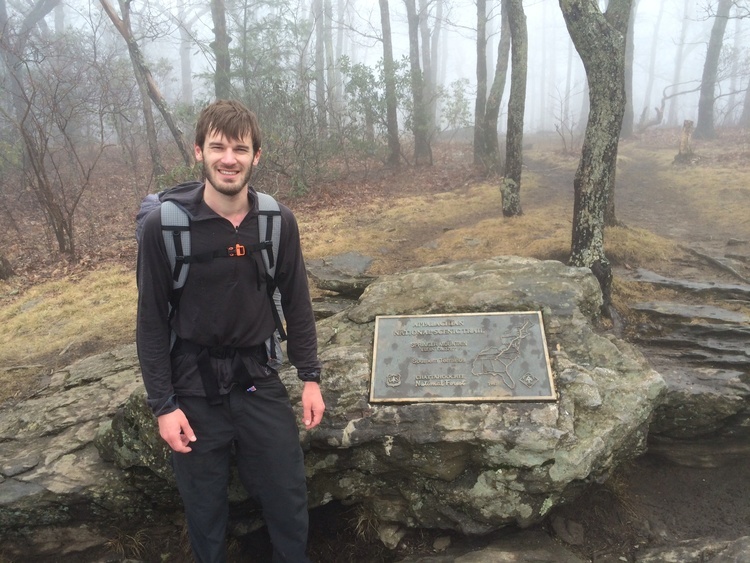 Doing more miles allows me to spend time where I want to spend it and enjoy many places along the Appalachian Trail. Here are a few photos during my journey so far. Most people would rather look at photos than read the nonsense I write anyway. 😊 The approach trail falls. Day 1. I look so healthy and clean. 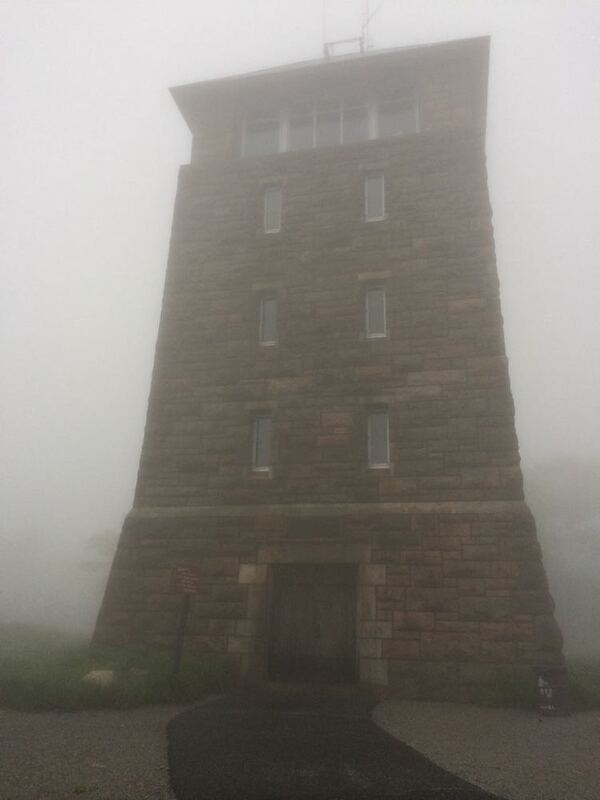 Springer Mountain. Just me, a rock, and a lot of fog. 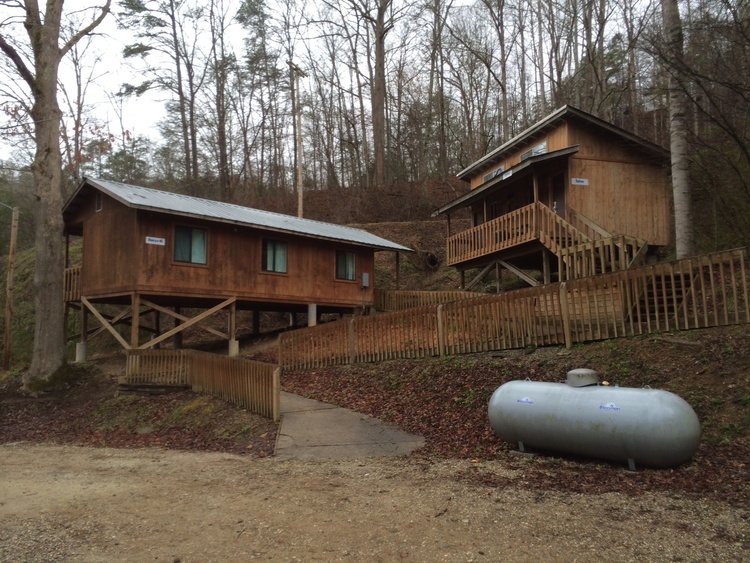 Albert Mountsin Fire Tower Nantahala Outdoor Center Bunk Houses. 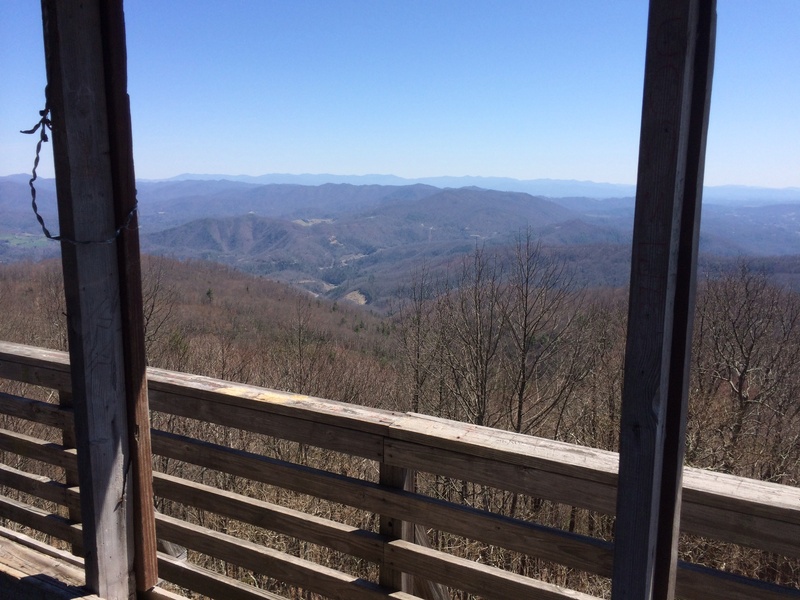 Fire tower that looks over Fantana Dam in the Smokies. 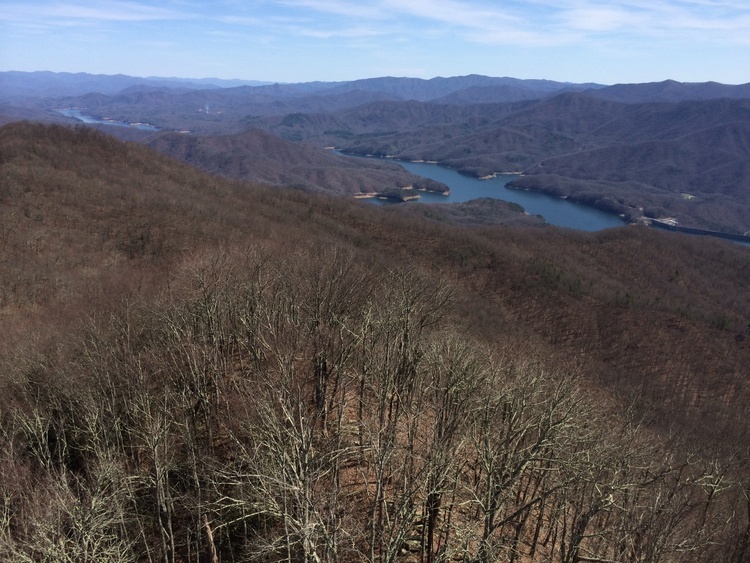 From a fire tower looking over Fontana Lake and the dam from the Smokies. 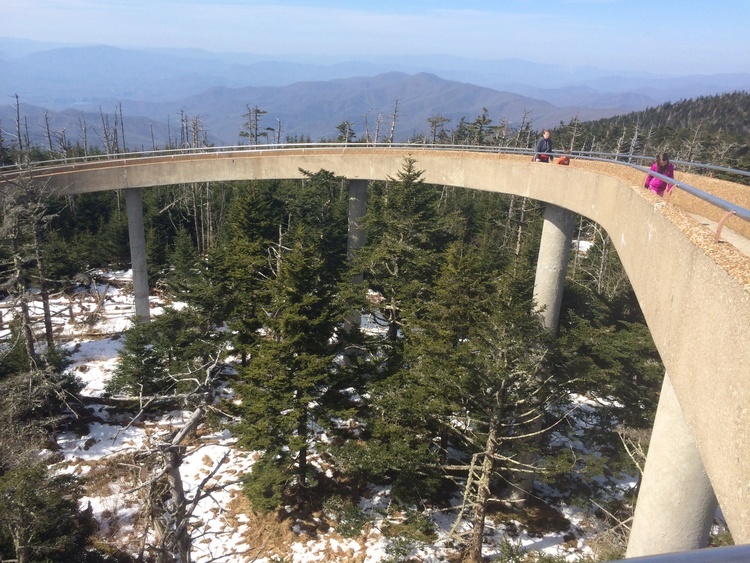 Smoky Mountains, Clingmans Dome. So it’s actually week 6 in my hike. I’m falling behind in writing. I started writing this 2 weeks ago. But anyway, I’m over 1/4 done with the trail. It’s been going well. Here is week fours write up. After 4 weeks on the trail I’m starting to finally find a routine. I remain in high spirits while feeling great physically and emotionally. I spent time this week taking a few days of rest to recover from the strain of the Smoky Mountains in small town of Hot Springs, NC. I’ve bought a pair of hiking poles and a small knee brace to reduce the impact on my knees, this has work well. My legs grow stronger and I hope to be able to increase the miles I average per day in the next few weeks when I get close to Virginia. 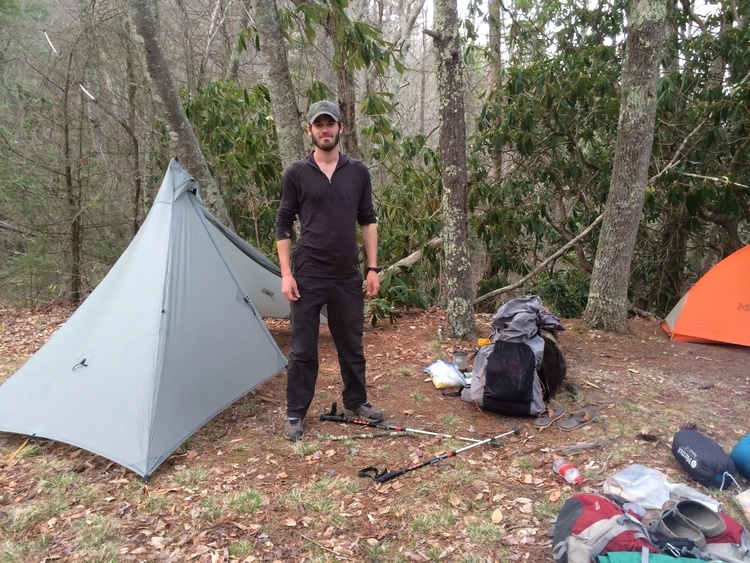 I started week 4 from a hostel at the end of the Smoky Mountains that is famous on the AT. The Standing Bear Farm is a very cool place. More relaxed and less business like that the other hostels that I have spent time in. There was an entire shed full of food and resupply stuff. The bunk house and kitchen area were very cool. I highly recomend this hostel. I should have taken a few pictures, but I think to at the time. From Standing Bear Farm I moved quickly to the Town of Hot Springs. I was looking forward to getting there because I had planned to take 2 full zero days in town to recover. I stayed all 3 nights in the Laughing Heart Hostel. Another very neat hostel that was being managed at the time by Chuck Norris and Tiger (Trail Names). I liked staying there very much. The town of Hot Springs was super conventent because the AT actually runs directly through the town. Enjoying a few very good meals with a few beers on draft was a great break from walking. 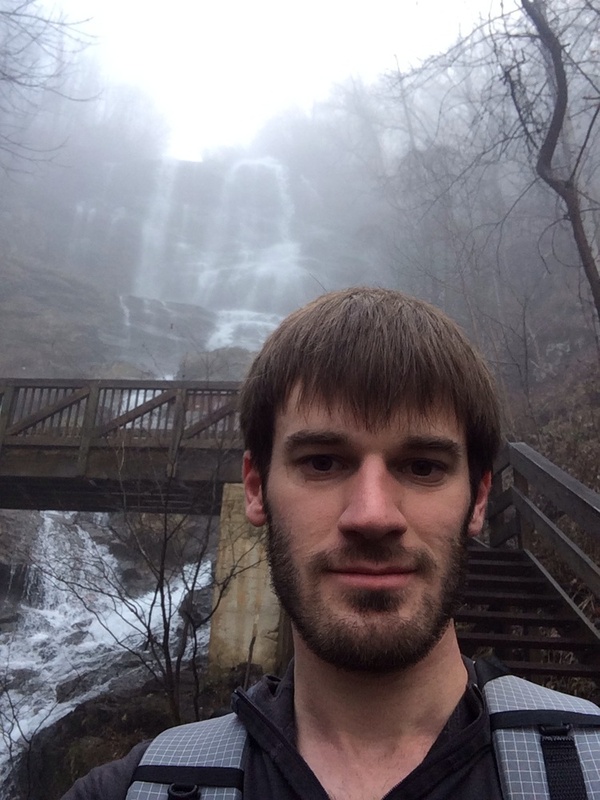 While taking two full days in Hot Springs I got to see a lot of hikers come through town. Some Hikers come into town and leave with in a few hours. Other seem to spend an entire week in town. If I stopped in every town for a week I’d go broke. It was a lot of fun to see a bunch of different hikers around town, but the trail is where I wanted to be. It was difficult to spend two full days in Hot Springs. I was starting to get stir crazy and was very excited to get back to the trail. I left the Town of Hot Springs in North Carolina towards Erwin, TN. I took my time the next few days not wanting to upset my knee again. Taking 10 miles the first day and doing 15 miles the next few days. I also wanted to take the time to adjust to using walking poles. Everyday went well and enjoyed the easier days as I walked towards Erwin.